"Queer Studies And Advanced Waxing"
The difficulty in evaluating a show that’s gone through as many changes as has Community is figuring out the metric by which it should be evaluated. It seems unfair to judge Yahoo-era Community any more harshly than one would judge any show in its sixth season, especially following considerable cast churn. On the other hand, while it was only appropriate to grade the off-pitch fourth season on a curve, with Dan Harmon running the show, there’s no reason why Community can’t be as good as ever. “Queer Studies And Advanced Waxing” isn’t a classic episode, but it’s the first episode of season six to approximate the energy and structure of classic Community. This season has been heartening so far, but “Queer Studies” suggests the ceiling on the season’s potential is higher than anticipated. “Queer Studies” manages to put the entire Save Greendale Committee in play, save for Frankie, who is pushed to the margins after a few episodes front and center. In doing so, the episode is able to accommodate three robust plots, with the show having gotten past the housekeeping phase. The increased length certainly helps—the episode is just over a half-hour—but as the first three episodes demonstrated, the extra length isn’t necessarily a benefit if it isn’t utilized effectively. “Queer Studies,” written by Matt Lawton, has enough to accomplish between its trio of stories that it’s appropriately paced. It feels brisker than any episode this season despite running the longest. 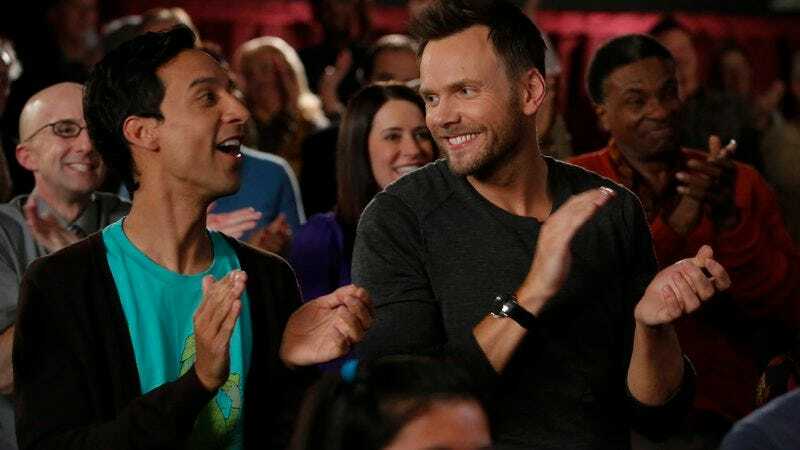 The nimbleness is not just a function of the structure, it’s also because “Queer Studies” is the first season-six episode to fully capture the manic energy that makes Community so irresistible at its best. It’s pretty amazing how much can be forgiven if the end result is a bunch of weirdos sitting around the study room table cracking wise and sniping at one another. It feels like an eternity ago, but there was once a time when the Study Group fiercely protected its exclusivity. Think back to “Investigative Journalism,” wherein Jack Black’s Buddy was intent on joining the group, and even Shirley, whose Christian values are the most developed facet of her character, was wary of an outsider trying to become “one of us.” The Save Greendale Committee isn’t nearly as snooty. It can’t really afford to be, which so few folks around, but it also doesn’t have to be. Elroy, Frankie, and Chang take their seats around the table like old friends, and it feels too right to be wrong. It feels so right, the Dean can make Elroy and Abed friends simply by declaring it. I want so badly for Abed to have a new partner in crime, the Dean’s blessing is all it takes. The Dean’s blessing carries a lot of weight in “Queer Studies,” which focuses on Dean Pelton navigating the politics of his sexuality after Richie and Carl extend him a board seat so long as he’s willing to come out as openly gay. The idea of Dean Pelton’s amorphous sexuality works much better as a joke the less actual detail is provided about it, and the episode capitalizes on that dynamic with lots of jokes about what the Dean’s sexuality isn’t. For the record, he’s kind of gay—two-sevenths or thereabouts—but the other five-sevenths “make gayness look like Mormonism.” It’s an interesting twist on a familiar riff, almost a reversal of the set-up in The Simpsons’ “A Fish Called Selma,” in which Troy McClure marries one of the Bouvier sisters to quell rumors of his undefined “alternative lifestyle.” Dean Pelton unveils his own sham relationship with the omnipresent Domingo to sell the notion that he’s gay when the truth is far more polarizing than that. Complicating matters is the fact that the Dean becomes a minor gay icon as a result of coming out and doesn’t have the heart to let down his newly acquired public. It’s a funny story but also a deeply provocative one, one that explores the role of sexuality plays in a person’s identity. People put considerable energy into figuring out how to embrace who and what they are, and that energy increases tenfold when who and what you are is something about which people go out of their way to express disapproval. Dean Pelton has put in that work, so just as it’s difficult for a gay person to pretend to be straight to win approval, a psychic toll comes with the Dean saying he’s gay to gain acceptance when he’s actually…whatever the hell he is. (“I’m so curious,” says Jeff. “Intellectually.”) It’s also a bold idea because part of what makes sexuality such a thorny issue is the urge to think of it in binary terms. It’s meant to be funny here, of course, but sometimes people are two-sevenths something you understand and five-sevenths something you don’t. The resolution is a pat, but smart, with the Dean losing his short-lived board position after coming out as openly political. Chang finally gets a story that works in the form of a stage version of The Karate Kid, which is mostly an excuse to make minute pop culture references and have Jason Mantzoukas screaming at Chang to squeeze a pure performance out of him. Chang’s human side comes through, which is an important development for the character. Yes, Community is cartoonish and superlatively meta, but it’s also a show with a rock solid emotional core, and it can’t afford to raise Chang to this level of prominence without humanizing him. This story effectively did that, and was apparently designed to do so, as even the characters talk openly about how Chang’s gripping stage performance suggests an emotional depth of which they were unaware. Finally, Elroy, who now has an official role at Greendale as its new IT guy, gets paired with his new bestie Abed to protect a bird’s nest from relocation. The thing that struck me most about the story was Elroy’s brutally logical monologue about how the laws of evolution permit them to do whatever they want to the nest. It’s indicative of the broader Jeffification of Community, which is perhaps to be expected given the show has two major additions in Elroy and Frankie, and Jeff’s voice is the one Harmon has always had the tightest grasp of. It makes sense that Elroy and Frankie would take on Jeff’s voice while the writers home in on exactly who they are, but it’s still fascinating to watch. Also, props to Keith David, who absolutely slayed everything this week. The chuffah between Elroy and Jeff about possibly pursuing a copyright suit over Donkey Kong was hysterical, and David excels at making explosive anger funny. The Donkey Kong riff was so exciting because it was most representative of the Community we fell in love with, and it suggests there’s plenty more where it came from. Yahoo must have gotten rid of its own bird nest because my desktop browser experience this week was by far the least maddening viewing experience I’ve had thus far. Annie to Chang: “Like Sidney Poitier or Meg Ryan before you, you were cast for race. Annie Kim was cast to replace Our Annie in the play. Super ouch. Richie’s maniacal “It gets better!” was hilarious. News flash Dean Pelton: You could do a hell of a lot worse than Domingo.